About a year ago I switched from my previous email marketing service provider (iContact) to AWeber. I procrastinated till this day to move my old list between providers. So, new subscribers went to AWeber, and I kept paying for the old subscribers staying on my iContact list. Well, no more! To celebrate my expenses cutting in half by finally closing the account with iContact, I’ve partnered with AWeber (what do you think about this landing page?) 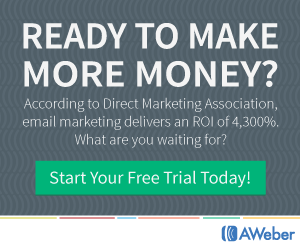 and I invite you to try out AWeber for free for 30 days. Share this giveaway after you enter and receive bonus entries. I’m using Gmail but have a business domain email.